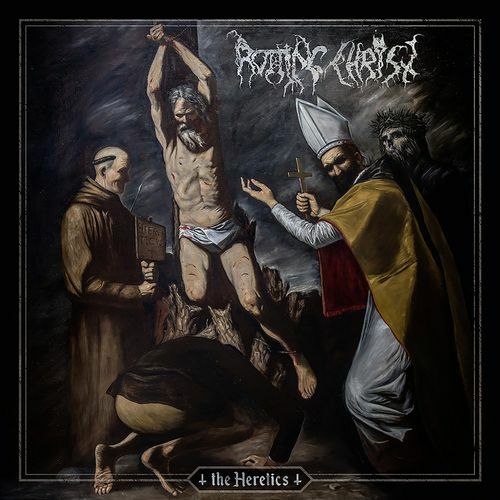 ROTTING CHRIST have existed in their own self-contained universe almost from the start of their career, which is now approaching the 30 year mark. They have never been interested in the typical trappings of what many perceive as extreme metal…they’ve never tried to be the fastest, the most brutal or, despite the obvious connotations of their name, the most blasphemous. They just create music on their own terms with no desire to meet any outside expectations. The Heretics is for sure the most cinematic of all ROTTING CHRIST albums. A lot of this sounds like it could be the soundtrack to The Name Of The Rose, or The Seventh Seal, or any dark medieval movie. Many of the songs here have a sonorous, monkish aspects to the vocals…an almost Gregorian chanting. As is typical, the pace is resolutely deliberate, with speed appearing only rarely. There are many quotes here from the likes of Nietzsche, Shakespeare, Poe, Thomas Paine and more. Some of the songs like ‘I Believe’ and ‘The Voice Of The Universe’ are almost entirely in the band’s native Greek. Party music or standard headbanging stuff this is most definitely not. I personally wish the band would inject some more aggression. When it does pop up here, it really brings things to a different level, like the excellent ‘I Believe’, where ripping fast metal combines with clean chanting vocals and deep spoken word in Greek to create something phenomenal. Another high point is ‘Fire, God And Fear’ where the droning high-speed riffs create a majestic feeling. Other than these two, most of the songs are mid-paced and feature deep symphonic touches. I must say I have never read a lyric sheet where the words “fire” and “hell” are mentioned so much. The band is obsessed with these concepts here, but seems to be reaching for something beyond the more obvious meanings. This is, above all, a highly philosophical work. That works for much of it, but there are times when things just get pompous and overblown. The obvious culprit here is last song ‘The Raven’, where the histrionic spoken word quotes from Poe seem overblown and contrived. If you’ve been a fan of past ROTTING CHRIST epics, The Heretics is a must have. But if you’ve never been into their one of a kind style of Greek darkness, this isn’t going to change your mind.